The church building in Trois Mats, which was destroyed by Hurricane Ike in Sept 2008. Grace Lutheran Church has been in partnership with the Light & Peace Mission and Pastor Ronald LeFranc since 2008. Since then we have forged a strong bond with the people in Trois Mares and in Chapotin, in the mountains close to the border with the Dominican Republic. 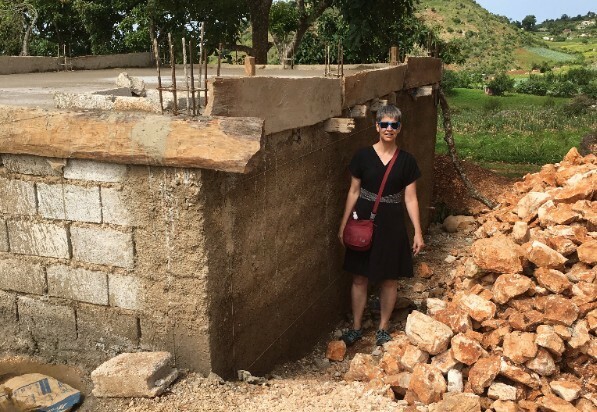 This big concrete box is the new community cistern in Chapottin, Haiti. 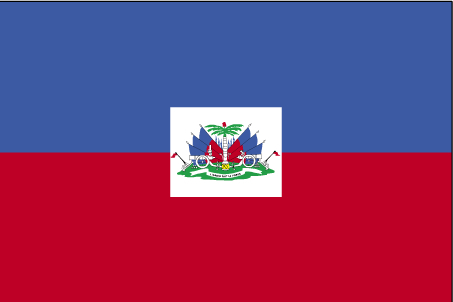 If they have the means, Haitian families use gutters to direct rain from their roofs into barrels or cisterns. But many don't have the means and four actually died of thirst during the severe drought last summer. For the past two years, generous friends and sponsors of Teaneck Packathon for Haiti contributed to build this cistern. We were so excited to see it last week, team member Fred Lewis took these photos to show you. At 14' wide x 18' long x 12' deep, our cistern can store 22,680 gallons for the Chapottin community. They are having good rains this year. Crops appear lush. As it is, this cistern is ready to fill. Workmen will plaster the walls, hang the gutters, and attach the filter, so people can easily fill their jerry cans and carry potable water home. Thanks to you, Chapottin will be ready for dryer times which are sure to come. Isn't it great to be part of a project like this? 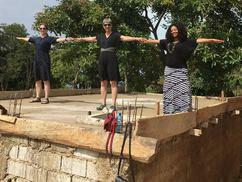 Jessica Rodgers, Kay Roseen and Jennifer Irish arm-spanned the cistern to show you how big it really is. Peering in, our team tries to see its depth, finally dropping a pebble to gage the wait time before the "plunk." 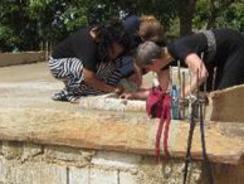 Rain water will run from the church roof into gutters draining into the top of the cistern. Bishop Ronald Lefranc, our host who ordered the project, tells us the cistern is as deep below ground as you see above ground, so 12 feet deep in all. A spigot and filter will be attached at a little pipe below my left elbow. Graduation Day: Even Bigger and Better than Anticipated!